Rinse rice in a mesh strainer with cold water. Set aside. 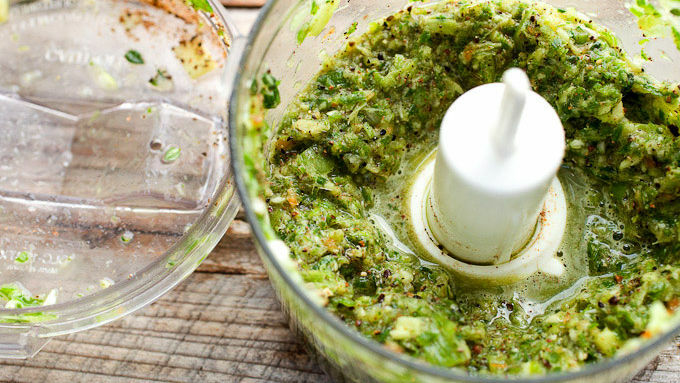 In a mini food processor, add scallions, garlic, ginger, habanero peppers, brown sugar, lime juice, thyme, allspice, nutmeg, and salt. Pulse until combined into a paste. In a medium bowl, add the spice paste, soy sauce, oil, and chicken. Mix well and let sit for at least 30 minutes or overnight. Heat a large skillet with high walls over medium-high heat. Add chicken pieces and let cook for 7-8 minutes until they start to brown. 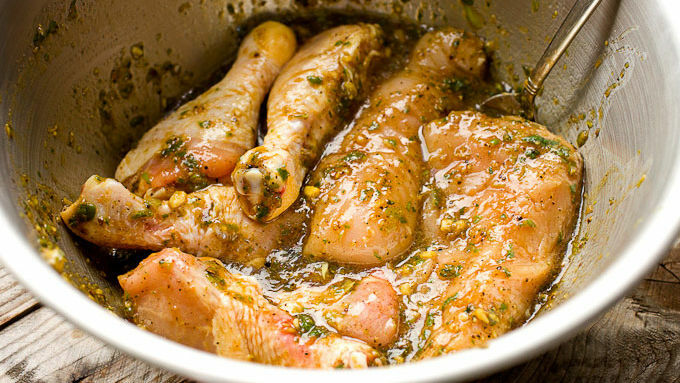 Turn chicken pieces and cook for another 4-5 minutes. Remove chicken from skillet and turn heat down to medium-low. It’s okay if the chicken isn’t cooked through at this point. Add onions to the skillet and cook them for a few minutes, scraping up any bits stuck to the pan. Add rinsed rice to the skillet along with chicken stock and stir to combine. Bring mixture to a slight simmer, turn heat down to low, and nestle chicken pieces back into the skillet along with bay leaves. Cover skillet and simmer for 20-25 minutes until rice is cooked and liquid is evaporated. Check the skillet occasionally and if it is dry, add more stock. Serve chicken and rice with fresh chopped scallions. 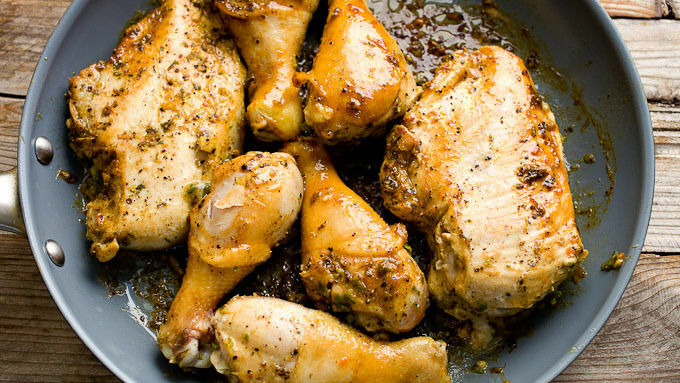 Jerk chicken is traditionally made with Scotch Bonnet peppers. These are hard to find so substitute habanero peppers. If you can find Scotch bonnet, use those! Regardless of which pepper you use, wash your hands after you handle them, as both are very spicy. A one-pot meal that brings some serious flavor! Let’s get this out of the way right away: Authentic jerk chicken is almost impossible to replicate at home. It involves a very specific kind of grill and wood and is just one of those things. 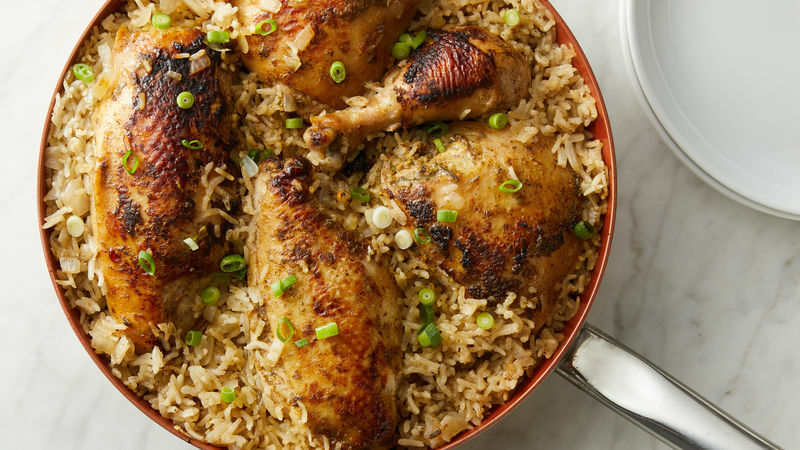 But, that doesn’t mean that we can’t pay homage to the delicious traditionally Jamaican dish by bringing the flavors into the kitchen for a much quicker and more realistic one-pot chicken and rice dish! Since we are taking some necessary shortcuts on the cooking, let’s not take shortcuts on the rub. I like to use fresh, real herbs and aromatics for my jerk rub. This means fresh peppers, garlic, ginger, scallions, thyme, and limes. When dealing with the spicy peppers, remember to remove the seeds and stem and wash your hands well after you are done! 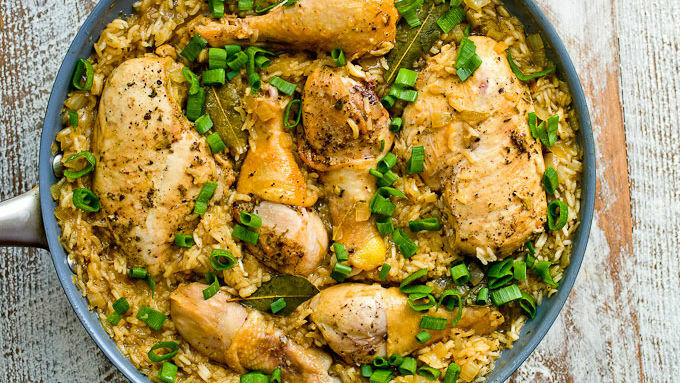 Serve the finished chicken and rice dish with fresh scallions. It’s just spicy enough to wake up your taste buds and it’s all in one pot so clean up is easy!